How profitable was your business this year? And if it wasn’t profitable, how much money did it lose? If you’re not sure, it’s time to put together an income statement. We’ll go over what exactly an income statement is, how to create one, and what it tells you about your business. An income statement shows you how profitable your business was over a given period. It does this by showing your revenue, minus your expenses and losses. Also sometimes called a “net income statement” or a “statement of earnings”, the income statement is one of the three major financial statements, along with the balance sheet and cash flow statement. Small businesses typically start producing income statements when a bank or investor wants to see how profitable their business is. When a business makes an income statement for internal use only, they’ll sometimes refer to it as a “profit and loss statement” (or P&L). Enter your transactions into this Excel template, and voila! You get a ready-made Income Statement. Perfect for entrepreneurs who aren't ready for full-fledged accounting software. 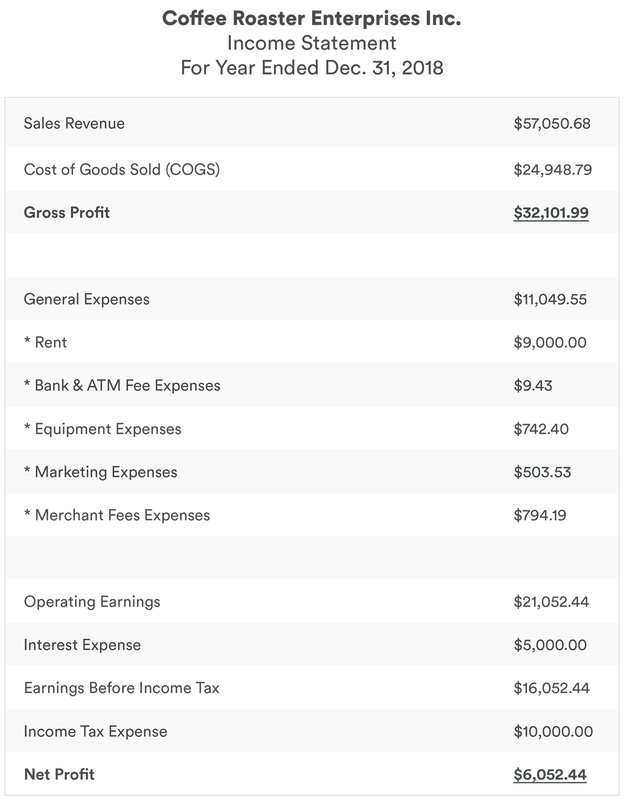 Here’s an income statement for a hypothetical small business—Coffee Roaster Enterprises Inc., a small hobbyist coffee roastery. Every income statement begins with your total revenue. How you calculate revenue will depend on whether or not you do cash or accrual accounting and how your company recognizes revenue, especially if you’re just calculating revenue for a single month. Sometimes shortened to “COGS,” this is all of the money you spent producing the goods or services you sold to your customers during that period. COGS only involves direct expenses like raw materials, labour and shipping costs. If you roast and sell coffee like Coffee Roaster Enterprises, for example, this might include the cost of raw coffee beans, wages, and packaging. Indirect expenses like utilities, bank fees and rent are not included in COGS—we put those in a separate category. This is what you get when you subtract total COGS from revenue. Gross profit tells you how profitable your business is after taking into account direct costs, but before taking into account overhead costs. Rent, Bank & ATM Fee Expenses, Equipment Expenses, Marketing & Advertising Expenses, and Merchant Fees Expenses are listed individually on this income statement. But some income statements will bundle these and other similar expenses together into one category called General Expenses. This is how profitable your business is after taking into account all internal business costs, but before taking into account external costs like loan interest payments and taxes. Accountants will sometimes call this Operating Profit, Operating Income or Earnings Before Interest and Taxes (EBIT). If your business owes someone money, it probably has to make monthly interest payments to whoever it owes money to. Interest expenses is the total interest payments your business made to its creditors for that period. This is your business’s profitability before it pays its taxes. This is how much you paid Uncle Sam. Ever wonder where we get the expression “bottom line” from? This is it! This is the final, total profit for your business. What’s the difference between an income statement and a balance sheet? A balance sheet shows you how much you have (assets), how much you owe (liabilities), and how much is left over (equity). The balance sheet is a snapshot of your whole business as it stands at a specific point in time. An income statement describes how profitable your business is. It shows you how much money flowed into and out of your business over a certain period of time. Most accounting software will generate income statements for you automatically, if all of the information in your system is up to date. First, collect all of the transactions your business made for the period covered by the income statement. If your business keeps an up to date general ledger, this should already be done for you. The transactions in your ledger fall into two categories: transactions involving balance sheet accounts (like assets, liabilities and equity) and transactions involving income statement accounts (like revenues, expenses, gains, and losses). We’re interested in the second category. Using all of the information you have about your income statement accounts, add up your total Sales Revenue, Cost of Goods Sold, General Expenses, Interest Expenses, and Income Tax Expenses. Plug all of this information into an Excel Income Statement template, and use that to calculate Gross Profit, Operating Earnings, Earnings Before Income Tax and Net Income. You don’t need fancy accounting software to create income statements. All you need is a bit of elbow grease and a good Excel template. Our expert bookkeepers here at Bench have built an Excel Income Statement template that you can use to turn your business transactions into an Income Statement. Still uneasy about tackling your income statement? Try a bookkeeping service like Bench. We’ll pair you with a bookkeeper who will prepare your financial statements for you—so you’ll always know where you stand.